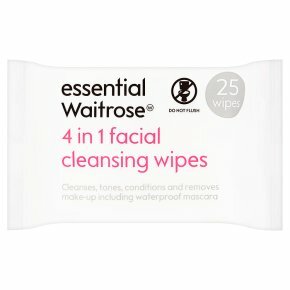 These cleansing wipes are part of the essential Waitrose range and as such they offer all the quality and value you'd expect. Each pack contains 25 wipes, which will effectively cleanse, remove make-up and moisturise. Each wipe is gentle enough to use on the delicate eye area and will remove even waterproof mascara. INGREDIENTS: Aqua, Propylene Glycol, Cetearyl Isononanoate, Polysorbate 20, Ceteareth-20, Cetearyl Alcohol, Phenoxyethanol, Glycerin, Glyceryl Stearate, Parfum, Methylparaben, Sodium Citrate, Cetyl Palmitate, Ceteareth-12, Benzoic Acid, Disodium EDTA, Propylparaben, 2-Bromo-2-Nitropropane-1,3-Diol. For external use only. KEEP OUT OF THE REACH OF CHILDREN. Avoid contact with eyes. If product enters eyes, rinse well with plenty of clean water. Do not flush down the toilet.